The stars include Dennis Brooks, Bill and Brian Stanaway performing as Second Wind; and Footlights and friends and Dianna George. Tricia and Kurt Huebschman, Jim Schmidt with Mark and Sharon San Angelo will recreate scenes from the summer smash hit Oliver! The list also includes amazing singers Karen Hughes, Trisha Wells, Lola Kennedy, Maureen Delaney-Lehman, pianist and singer Ronda McGreevy, this year’s International Idol winner Danielle Petingalo, violinists Josh and Sam Scott, local favorite Gentleman George Snider, the fabulous Lock Cities Chorus of Sweet Adelines, and more. The local Rotary clubs and the best local performers combine their talents for a magical time for the area residents. 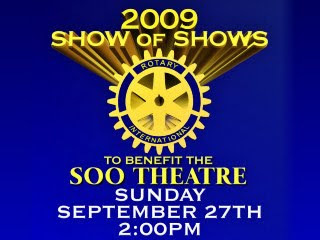 The second annual Rotary Show of Shows returns for one day only, Sunday, September 27, 2009 at 2:00 pm. Tickets for adults are $10, students are $5. For additional information, please contact the Soo Theatre Project at (906) 632-1930 or www.sootheatre.org. Soo Theatre Project is located at 534 Ashmun Street, Sault Ste. Marie, MI 49783. This benefit for the Soo Theatre Project will be helping them continue entertaining you year after year. Come, join, and support the Soo Theatre Project. STARS (Soo Theatre Arts Resource Studios) and Soo Theatre have expanded across the street, now sharing space with Austin’s Oak. About three weeks ago the dividing wall went up and the work commenced. Dianna George, Soo Theatre founder and STARS Dance Director, and many dedicated volunteers have been putting in the hours and hours of work to make this new space a beautiful addition to the STARS studios. STARS has been expanding in student enrollment since its inception four years ago. An Open House for the STARS annex Studio E will be on Wednesday, September 9th at 4:00 p.m. in the newly renovated studio space across the street from STARS and Soo Theatre Project. Lea Cilluffo, Hip Hop and Jazz. Darga, Bailey, and Cilluffo are members of the LSSU Dance Company directed by Deb Choszczyk. Martina Vollman has been teaching ballroom for the past three years and Kaley Darga has been teaching at STARS for the past two years. Jillena Rose will be teaching Show and Tell: experiment with mixed visual media and writing. Other classes that have been added are Daytime Dancing for Adults, Beginning Tap for Adults, Modern, Lyrical/Jazz, Scottish Country Dance, and Acrobatics. STARS still offers 45 dance classes, 16 new, plus classes in Musical Theatre, Piano, Acting, Yoga, Tunes for Toddlers, Voice, and Creative Writing. Private lessons are offered in Violin, Cello, Harp, Voice, Woodwinds, and Brass. The performing groups include: the Recorder consort, Intermediate Youth Orchestra, Senior Youth Orchestra, Flute Choir, Not Quite Ready for Prime Time Players Adult Strings, and the Footlight Dance Theatre. You can find the STARS Fall 2009 Class Brochure and Student Registration Form on the web. The Studio E Open House is Wednesday, September 9th at 4:00 p.m. at STARS Annex Studio E, 539 Ashmun Street in Sault Ste. Marie, MI across from the Soo Theatre Project. Further information please contact the Soo Theatre Project (906) 632-1930 and/or website www.sootheatre.org. Come, support, and join the Soo Theatre Project and STARS. 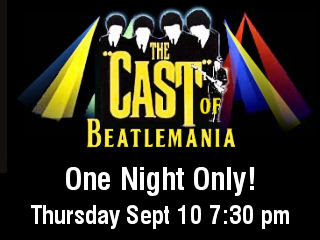 *Also do not forget The Cast of Beatlemania coming to the Soo Theatre Project for one night only on Thursday, September 10th at 7:30 pm. Admission is $20.00. Broadway to Sault Ste. Marie, this Broadway cast has been touring the world for years. They sound and look just like the Beatles! This two-act performance will bring you back to the days of the frenzy known as “Beatlemania.” They will be performing such hits as "I Want To Hold Your Hand," "A Hard Day’s Night," "Sgt. Pepper," "Hey Jude," plus many more of your favorites. For more information, see our previous posting. Once again, international tenor Eric Shaw, native of Sault Ste. Marie, Ontario, returns home for a benefit for the Soo Theatre Project in Sault Ste. Marie, Michigan. Now based in Toronto, Mr. Shaw will appear Thursday night, September 3, in a production that features the music of George and Ira Gershwin. "I enjoy this music for the cleverness of the lyrics and unfailingly tuneful music. Both the accompaniment and music are quite sophisticated, but come across as fun and breezy. These are real entertainment pieces that have staying power due to their timeless themes and hummable melodies." See more of the article from the Sault Star website. 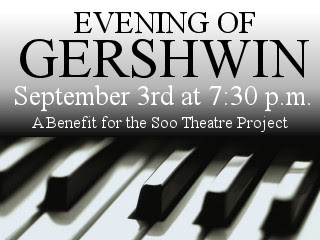 The curtain rises on An Evening of Gershwin on Thursday, September 3 at 7:30 p.m. Mike Dempsey, originally from Sault, Michigan, arranged the music and will play piano and sing in the production. In addition to Mr. Shaw, Mike's friends for the Soo Theatre performance will feature: soprano Karen Hughes Beacom, resident opera singer, voice teacher and music director at Soo Theatre Project and STARS; baritone John Young who often sings in Mike Dempsey's productions; and soprano Maureen Delaney-Lehman and mezzo-soprano Trisha Wells, both of Sault, Michigan. Tom Ewing and Tom Lehman, also of Sault, Michigan, will narrate. Please join us for an evening of delightful music and support the Soo Theatre Project!